In the run-up to the fifth EU-Africa summit in Côte d’Ivoire, the future of the Economic Partnership Agreements (EPAs) between Europe and its former colonies looks bleaker than ever. While most of Europe’s trade partners around the world keep refusing to sign the deals, the African Union’s Commissioner for Trade will most likely announce a moratorium on all EPAs. Ever since independence, Europe’s former colonies have enjoyed preferential (duty-free) access to the European market. In turn they didn’t need to open their own markets. When in 2000 the World Trade Organization deemed this one-sided market opening unlawful, Europe and 79 countries in Africa, the Caribbean and the Pacific (ACP) started negotiating reciprocal trade deals. The resulting deals, coined Economic Partnership Agreements or EPAs, are not pure free trade deals. Under the agreements, ACP countries are allowed to keep protecting 20 percent of their products - mostly agricultural products - with import tariffs. The other 80 percent will be liberalized gradually over the course of 20 years after the signing and ratification of the deal. The deals were negotiated between the European Commission and seven regions of several countries engaged in economic integration processes. Seventeen years later only two of the seven negotiated deals have been signed, ratified and implemented, one with the South African Development Community (Botswana, Lesotho, Namibia, South Africa and Swaziland) and one with the Caribbean. The EPA with West Africa is currently blocked by Nigeria, Gambia and Mauritania who refuse to sign, while in the East African region, last year Tanzania sued Kenya for signing while Uganda wants to address more concerns - President Museveni travelled to Brussels on a three-day work visit at the end of September for talks. Almost all ACP countries fear the possible negative impact of the EPAs on their economies and therefore stall its implementation. "They already had the right to export to Europe duty-free," said Joyce Naar, a lawyer and activist with the ACP Civil Society Forum. "Now they are expected to open up their markets to Europe without getting anything back." Especially in Africa, governments and analysts fear an encore of the tomato and chicken scenario. In Ghana, for instance, after IMF and World Bank-enforced tariff reductions, import surges caused the market share for domestic chicken to fall from 100 percent to a mere three percent today in less than three decades. The chicken industry, once the second largest employer in the country, has now been taken over by competing imports from Canada, Brazil, Europe and China. As for tomatoes, after lowering tariffs Ghana became the second largest importer of tomatoes in the world and according to FAO data, market share for domestic produce dwindled from 92 to 57 percent in only five years. Aside from agricultural produce, NGOs also fear that entire industrialization of the continent is at risk. At a recent international trade union conference on the issue of EPAs in Togo, this point was repeatedly made. "To industrialize, we need to protect and develop the internal market until we’re ready for international competition, as has been demonstrated by China," says Georgios Altintzis of he International Trade Union Confederation (ETUC). At the conference, Mariama Williams, senior program officer at the South Center in Geneva, also stressed that increased competition would lead to increasing feminization of work. "Women do the worst jobs in the worst conditions," she stated at the conference. According to Williams, EPAs will have the greatest impact on labour-intensive industries where women are disproportionately employed. An increase of competition would raise the pressure on these sectors while the internal standards and labour conditions remain unchanged. "Diabolic" agreements or success story? 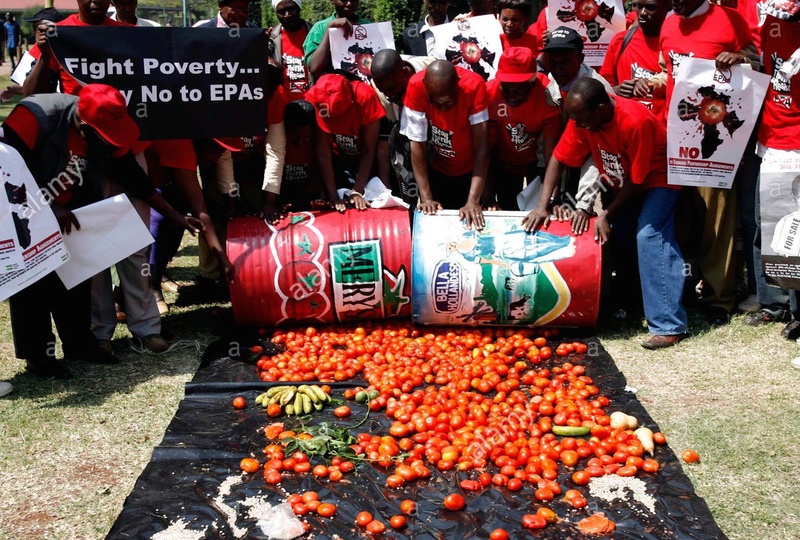 "There has always been a diabolic whiff about EPAs," former EPA chief negotiator Sandra Gallina said a few weeks ago at a meeting of trade ministers from all ACP countries in Brussels. "There is nothing diabolic about them, they were just extremely badly communicated. For the last five years I have been fighting a misinformation campaign." On the first day of the Brussels meeting, the European Commission published numbers on its website meant to illustrate the benefits of EPAs. In 2012 an agreement entered into force between Madagascar and the EU. By 2016, exports to the EU had risen by 65 percent. The same for South Africa, which signed an agreement one year ago. The last year, exports of processed fish increased by 16 percent and flowers by 20 percent. According to Marc Maes, trade policy officer at the Flemish North South Movement 11.11.11, the figures should be taken with a grain of salt. "Madagascar is recovering from a period of total chaos," he said. "Do these numbers show the influence of the EPA or mere economic recovery? In the case of South Africa, the mentioned period consists of just one year. It’s a bit premature to talk about a steady, reliable impact." The criticism isn’t limited to the content of the agreements. The way in which the European Commission concludes them is also widely condemned. As agreements with entire regions are stalled, the Commission now makes agreements with individual states. Ghana and Côte d’Ivoire signed and ratified such interim EPAs a year ago, fearing they would lose preferential access to the European market. "That’s crazy," says Gunther Nooke, personal representative in Africa of German Chancellor Angela Merkel and one of the staunchest critics of the EPAs. "Trade between neighbors is now more difficult than trade with the EU. We are creating borders within Africa. " According to Nooke, in the midst of a migration crisis the only things that benefits Europe and Africa is more employment in Africa. "This can only be done by protecting the entire African market with the creation of an African Customs Union led by the African Union. African products can be made here and be freely traded across the continent without having to compete with European goods. But now, because of differences in opinion about EPAs, African countries aren’t making any progress in forming a customs union." According to Merkel’s envoy, the African Union Commissioner for Trade has already announced that he will call for a moratorium on all EPAs. "And we must respect that," says the advisor. Germany is in the perfect position to make its opinion be heard. The country delivers the greatest contribution to the European Development Budget: just over 6.2 billion euros in the period 2014-2020, accounting for 20.6 percent of the total. It is doubtful whether Berlin and Brussels will be able to voice their opinions in unison at the Nov. 28-29 EU-Africa Summit in Abidjan.